Long time laptop manufacturer, Lenovo has been easing its way into the tablet sector lately with its IdeadPad K1 and ThinkPad tablets. The 7” IdeaPad A1 will be the newest member of the family bringing with it an attractive $199 price tag. The A1 specs aren’t all that, but it’s an Android tablet on the cheap nonetheless. While the onboard OS is Gingerbread, Lenovo has augmented it with the same special launcher software as debuted on the K1. The A1 will sport a 1GHz processor, have two cameras, up to 32GB of storage, and a 7” 1024×600 resolution screen. Lenovo also plans to bundle the Lenovo App Shop in addition to Android Market. The App Shop will supply only apps designed for Lenovo Tablets, and if that’s got you skeptical, they’ve promised 200 apps at launch. That'll definitely turn some Nook Color owners to the Lenovo side. 200 apps @ launch!? I'd take Quality apps over the Quantity any day. I am not sure about 7 inch displays..... I think it's a niche market..... too big to be a phone.... too small to be a tablet. I'm not saying it does not have a place; I'm just saying that that place is probably not very large (no pun intended). Also to note is a 1Ghz processor is; it's a single core Cortex A8. I doubt this tablet will be very quick. OH, there is only a 3Megapixel camera on board with it. Suddenly; this seems over priced to me. Have you played with a rooted Nook Color? With the IPS screen it's a really nice device. 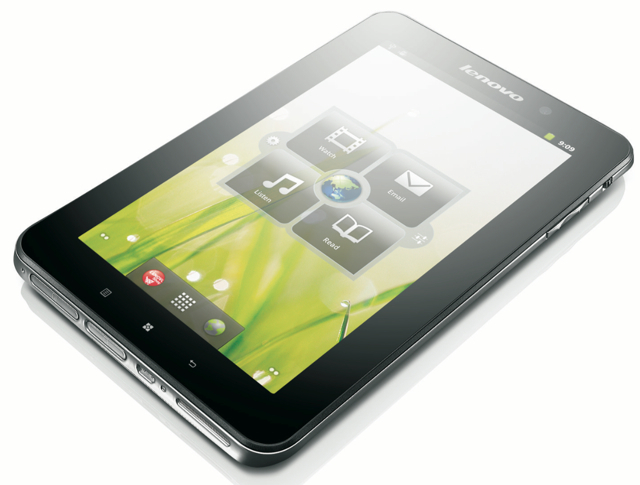 Same processor as the Lenovo -- you're right, you can feel the difference between a single and dual-core tablet. The Lenovo also has a camera and a few other nice features. But if you check out the user base at androidtablets.net, you'll see there is a pretty decent community for the 7" form factor. Remember $199 is the early-adopter price. I don't know how far the Lenovo will fall ($149?) but once the Amazon 7" tablet gets announced, $199 will seem like a distant memory. My personal preference is 10", dual-core, Honeycomb, etc. I really prefer the larger screen for web browsing. But I wouldn't count the 7" out at this point. BTW, there are also long-standing rumors of an iPad mini -- I guarantee you (and do I hate to admit it, but) if Apple produces it, suddenly 7" will the IN size. I've dabbled in the 7 inch tablets a bit.... I always walk away thinking it's just too small for what I would use it for. I have not had the chance to play around with a rooted nook. I'm sure it's better than a stock one but only slightly. Software changes only go so far. If the hardware is not high end; that's the brick wall. For a while $250 for the Nook was a super deal for a pretty nice device -- but I don't want to oversell it! Anyway, my last sales pitch: I haven't played much with ours since I rooted and installed Eclair (Froyo, Gingerbread, and Honeycomb are also possible), and then my wife grabbed it!! But it depends on what you want to do with it -- in our case, things like eBooks, web browsing, news, email, movies, etc. all work super. Games are hit and miss -- some good, others not so much. I can't emphasize enough how nice the screen is. But as we start to see a new price-point for 7", things may change. Oh, a final point about the Nook: Barnes and Noble does their best to lock it as an ereader -- so owners who want a real Android tablet have to be willing to mod it. That was a big plus for me, but for others who want to "set it and forget it", a device like that would be a mistake. Let's be honest here..... in this day and age; you can't just buy electronics and not toy around with them. Everything I own is modded in one way or another. People who spend cash on things and use them "as is" are just plain and simply missing out. Maybe you forgot this is droidforum! We're a unique breed. Think about it this way -- though you didn't explicitly mention Apple -- every time someone buys an iPod or a MacBook or an iPad, that's another "as is" consumer. Sad...but you and I are WAY outnumbered! Although it is a bit small for web browsing so maybe someone will have an 8" version. Sammy has an 8.9 coming out so that might be close to ideally I would want. As long as it fits in my wife's purse. Minus side: could be faster, needs WiFi to update GPS maps in real time, buggy factory installed software, neither camera has a flash. Looking into rooting it: to raise the CPU speed, to drop the Chrom-ish browser from being default and to remove buggy Lenovo app store software. Cannot drive very far from a WiFi connection until Google Navigation starts having trouble. Maybe a few hundred yards. Using FoxFi on a DroidX2 (DX2 is used as a hot spot) to link DX2 with my A1 seems to be a good method of using the A1 as a GPS instead of the DX2. Screen size of A1 is roughly 3x the DX2. The Lenovo App Store, when launched, proclaims there is a newer version of the Lenovo store app available, then when you accept downloading that newer version and you try installing it, upgrade always fails to install (I following all the instructions, naturally). Buggy software is that Lenovo App Store. Oddness: unless you use Airplane mode and then re-enable WiFi, you will get information saying the most battery power is used by the cellphone standby system. This device has no cellphone, as far as I can tell. As a factory fresh tablet, it is good as a note taker, ok as an MP3 player (but: 1] needs display to be darkened or you hear crackling, 2] not too good with FLAC), not too good as a video player (refuses to play some versions of .wmv files and several other more recent and popular formats are unsupported), the touch screen is only 2 point, and the default keyboard interface seems to have real issues with sensing slow motions such as when I'm highlighting words in a text editing setting. All such editing situations, not just one app. Yes, even after touch screen recalibration. All said, it is a decent device for its release date, is a bit dated now, and I like the form factor as it fits snug in my back pocket. If I had to buy another tablet to replace the A1, the Matrix One 7 has ICS, 5 point capacitive screen and comes rooted.... for $60 right NOW. In a few days, it will jump to $120.